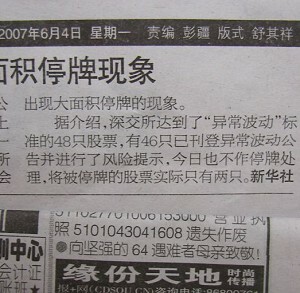 Chen Yunfei, a small-business owner in Sichuan, was placed under house arrest after putting an advertisement for the June 4th Movement in the Chengdu Evening News . When he regained his freedom on December 3, 2007, he went to the Chengdu Evening News offices to apologize to the staff members who were implicated during the incident. He was interviewed by The Epoch Times on December 5 and said that he had no regrets about his actions, although he was placed under house arrest by the authorities due to the advertisement. However he felt badly for the media staff who were implicated during the event. 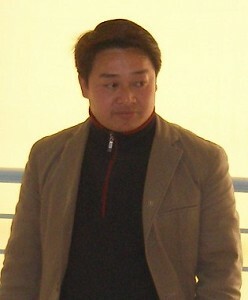 On June 5, authorities arrested Cheng Yunfei and detained him in his home under the charges that he was “subverting the political power of the state and overthrowing the socialist system.” The next day, he was sentenced to a half year of “supervision in residence” (“house arrest”), and his individual actions were then restricted. On December 3, the authorities lifted the surveillance order and he regained his freedom. On December 4, Chen Yunfei and Huang Xiaomi, another human rights activist, went to the office of the Chengdu Evening News and apologized to all staff who got in trouble or were demoted as a result of the advertisement. Chen said he went there with the knowledge that a number of high-ranking members in the Chengdu Evening News and other employees in advertising agencies had been demoted or lost their jobs. According to some of Huang Xiaomi's friends in those media circles, the advertisement made quite a stir in media circles around China. The CCP authorities published an inside notice to nearly one million media personnel, requesting them to be on guard against similar events in the future. At this moment, it is now the 3rd anniversary of the publishing of the Nine Commentaries on the Communist Party by The Epoch Times . The number of people who have quit the CCP and its affiliated organizations have reached nearly 30 million. Chen Yunfei told the reporter that he had already read the book, Nine Commentaries on the Communist Party , and he thought it was an enlightening book that provides authentic data, historical facts, and deep analysis. The book inspires people and awakens people's consciences. He added that the book exposes the CCP's true colors and has disintegrated the party culture. Chen said that he would take this opportunity to declare his withdrawal from the Youth League in support of the 30 million who have quit the CCP and its affiliated organizations. Chen Yunfei said that the movement to quit the CCP and its affiliated organizations is very peaceful and reasonable and everybody can join it. The movement can awaken people's consciences, recover their morals, and it helps them know the true situation. The movement is functional, quite accessible, and in a position to become more popular, and he encourages more and more people to participate in it.